About a year ago, there was a blog called "Big Pairs" that had started up, but as is all too often the way with betting blogs, it didn't last long. Their short lives are usually because the writer suddenly realises that enthusiasm isn't actually an edge, and rapidly dwindles as losses mount, but another reason is that the author realises how much time and effort it takes to find something new / interesting to blog about every few days. I'm not sure what Big Pairs reason for closing down was, but I just noticed that he is back - actually has been for four months, but unnoticed because I'd listed it under "Other Blogs I Read", probably because there was a lot of FOREX trading in there. In exactly 136 weeks from now I will resign from my job and start a new life working for myself. I watched a fantastic video the other day by a guy who gave up his $100,000 job in Australia to start a forex trading company. Of course the gamble paid off, and Aussie Bruce is now rolling in money! I rather doubt that 'fantastic videos' of all the failures are out there for our viewing pleasure. To keep things interesting and measure my performance I've set myself a challenge to grow a modest £1000 bankroll by 10% a week for this first year. Nothing like setting realistic goals for yourself. 10% a week would mean a bankroll after 52 weeks of a mere £142,042 - give or take a few pennies. To be honest, I skipped through to the latest results, where after 17 weeks, we should be sitting on a bank of around £5,054 - give or take a few pennies. This week saw more of the same and my £1,000 bankroll tumbled further into the abyss. The balance now stands at £394.21. I can really picture what life will be like once I'm retired. I'm already thinking about what I want to do with my time outside of any trading/betting work. I'm keen to diversify my income streams so that I'm not reliant on this for paying the bills. That's a good thing, or the bills will be in collection soon. The author is now putting his future in the hands of a horse racing system called "Longshots Live", and if I know anything about horse racing, it is that the favourite-longshot bias is alive and well, and longshots are not where the smart money is going. An income stream, it is not. I tend to like to back at long odds or lay at short odds - pays well when they land and doesn't kill a bankroll when they don't. The problem is that they don't land often enough, and the bankroll will die a slow and lingering death. Read up on the favourite-longshot bias. There are no shortcuts. I spend at least one hour a day updating data and more time analysing patterns. Unfortunately my new business partner in this exciting venture wasn't well all week so we are yet to get firing. Investing shouldn't be exciting, and who needs a business partner in a venture with a starting bank of £1,000? No wonder the poor chap wasn't well last week - he's just lost most of his life savings! I don't intend to be mean spirited here, but posts shouldn't be misleading and goals need to be realistic. A goal of 10% a week is not realistic and anyone who understands trading, as Big Pairs claims to, would know this. Giving up a steady job for a solo FOREX trading 'career' is not realistic either. I've asked before - what do you know about the FOREX markets that the professionals don't know? Where is your edge coming from? This chapter began with a table showing the contrast between what people think random events are like and what they are really like. Here we will explore some of the reasons that people have these erroneous beliefs. It has been well documented that most people—even those who understand that any result of a series of tosses of a fair coin is a random sequence—make errors in their judgements about random sequences. The following is a list of some possible explanations for this tendency. The focus here is not on superstitious beliefs, but on cognitive processes and experiences that might lead a person to hold faulty beliefs. For a more complete examination of erroneous beliefs in gambling, see Wagenaar (1988); Ladouceur and Walker (1996); Kahneman and Tversky (1982); Toneatto (1999); and Toneatto, Blitz-Miller, Calderwood, Dragonetti, and Tsanos (1997). People will often judge the coin-tossing sequence of H, H, H, H, H, H as being less random than H, T, H, H, T, H, even though the probability of obtaining each of these given sequences is identical: 1/2 x 1/2 x 1/2 x 1/2 x 1/2 x 1/2 = 0.015625. Note that this is the probability of getting a specific sequence compared to the probability of getting a second specific sequence. Kahneman and Tversky (1982) call this tendency the representativeness heuristic. People who make this error are often computing the probability of getting 6 consecutive heads compared to every other possible sequence. Most random sequences of heads and tails do not have an easily recognizable pattern. This tends to reinforce the belief that a sequence of all heads is less likely. However, any one specific arbitrary combination of heads and tails has exactly the same chance of occurring as any other specific combination. Another factor that contributes to this error is that there is only one possible way of getting 6 heads and only one possible way of getting 6 tails, while there are a total of 64 possible ways of tossing six coins, 20 of which produce exactly 50% heads (e.g., H, T, T, T, H, H or H, T, H, H, T, T). This gives the illusion that combinations that “look random,” are more likely, but in fact each one of those specific combinations (e.g., H, T, T, T, H, H) has the same chance of occurring as H, H, H, H, H, H.
Another reason for errors in our understanding of randomness may be confusion between the way the word random is used in everyday speech and the way it is used in statistics and mathematics. According to the Merriam-Webster Online Dictionary, the most common meaning of the adjective random is “lacking a definite plan, purpose, or pattern.” It also lists “haphazard” as a synonym (www.m-w.com). Judging solely by its appearance, a sequence of 6 heads in a row might appear to have a pattern. Probability theory, however, is concerned with how the events in a sequence are produced, not in how they appear after the fact. A third reason is the tendency of the human brain toward “selective reporting”—the habit of seizing on certain events as significant, while ignoring the other neighbouring events that would give the chosen events context and help to evaluate how likely or unlikely the perceived pattern really is. Big or salient events will be recalled better. We recall plane crashes because they are highly publicized. Uneventful flights are ignored. Because of the occasional well-publicized plane crash many people are afraid to fly, even though plane crashes are much rarer than car crashes. Kahneman and Tversky (1982) call this tendency the availability heuristic. A closely related tendency is for people to underestimate the likelihood of repeated numbers, sequences, or rare events occurring by pure chance. The basic problem is that we do not take into account the number of opportunities for something to occur, so we are often surprised when random chance produces coincidences. As an example, in a class of 35 students, we assume that the chance of 2 people sharing a birthday is very small, say 1 in 365, or maybe 35 in 365 (Arnold, 1978). The actual probability that at least two people will share the same birthday is close to 100% because there are actually (35 x 34) / 2 = 595 possible combinations of people in the class. Because the possible combinations of people (595) exceed the number of days in the year (365), the chance that at least 1 pair of people will share a birthday is surprisingly high. Our minds are predisposed to find patterns, not to discount them. It is argued that we have evolved the ability to detect patterns because to do so was often essential for survival. For example, if a person was walking in the jungle and saw a pattern of light and dark stripes in the shadows, it would be prudent to assume that the pattern was a tiger and act accordingly. The consequences of incorrectly assuming that the pattern is not a tiger far outweigh those of incorrectly assuming that it is. But when applied to random events, this survival “skill” leads to errors. Some errors might be the result of the way in which statistics are disseminated. Academics, journalists, advertisers and others often report statistics using terms such as “1 out of every 10,” or “1 death every 25 seconds.” These statements might lead to the impression that the events reported occur in a regular manner. We learn through experience and logically induce general rules on that basis. If our experience is limited, we may induce the wrong rule. A chance occurrence may lead to false expectations. As a result, a win the first time one plays a game, or a win after some extraneous event, may lead to the formulation of an erroneous general rule. For example, a bingo player reported that she was once about to buy her bingo booklet, but was called away for some reason. Later, she bought her booklet and then won. Now she has a ritual of going back to the end of the line if she does not feel that the serial numbers are lucky, and she reports that this system has worked for her on at least one other occasion. Individuals who gamble often think that random events are self-correcting. One possible reason for this is that their experience seems to be consistent with this belief. Closely related to the law of large numbers is the phenomenon of “regression to the mean,” which predicts that exceptional outcomes (e.g., very high or very low scores) will most likely be followed by scores that are closer to the mean. For example, a father who is very tall is more likely to have a son who is shorter than he is, not taller. It is true that a tall man is more likely to have a tall son than a short one, because height is partly under genetic control. However, the random factors that influence height (the recombination of the parents’ genes, nutrition, accidents, diseases, etc.) will tend to pull the son’s height down closer to the average for the general population. The fact is that, by pure chance, there is more room to move down, closer to the mean, than up, away from the mean. To turn to a gambling example, suppose a coin is tossed 100 times, and 80% are heads. If the coin is tossed another 100 times, the net outcome is more likely to move closer 50% heads than to stay at 80% heads or to increase to 90%. But it is important to understand that regression to the mean does not have to occur: the son could be taller or the next 100 flips could all be heads. But it is more likely that the son’s height or the number of heads and tails will be closer to the mean because the mean is the single most likely outcome. In the context of gambling, regression to the mean might produce the illusion that the random events are “evening out.” Unusual events (long losing streaks or winning streaks) seem to be corrected over time, but in fact they are not corrected, only diluted. The average converges towards the mean; it is not pushed there. But the experience from event to event gives the illusion that it is pushed there by some sort of force. One final reason for errors in judging random events is that our minds tend to segment events in ways that are consistent with what we expect. Given a heads and tails sequence of H, H, H, H, T, H, H, H, T, T, T, T, H, we are likely to divide this string into a segment in which H was more likely to appear (H, H, H, H, T, H, H, H) and one in which T was more likely to appear (T, T, T, T, H). This segmentation process is very often used by sports commentators (e.g., “The Blue Jays have now won 5 of their last 6 games,” or “A player has struck out 11 times in his last 15 at bat”). In segmenting the sequence this way, it is very easy to convince oneself that tails did in fact come up more often, to correct for the excess of heads. As noted above, our minds are predisposed to find patterns, not to discount them. The Draw-4 System has a stellar weekend with three winners from three selections. Tottenham Hotspur v Liverpool and Crystal Palace v AFC Bournemouth on Saturday were followed by a perfect draw on Sunday between West Bromwich Albion and Middlesbrough. Courtesy of Greg Evans and The Football Pink, I was pleased to read that I am not the only person in history who thinks the 0:0 draw is 'perfect'. The great Italian player and coach Annibale Frossi once said: “0-0 is the perfect result because it is the expression of total balance between the attack and the defence of the two teams"
other sources suggest that Frossi "OFTEN" declared that "the perfect result to a football game is 0–0". The Gazeeta World article I mentioned was premature because after a slow start to the 0:0 scoreline last season, perfect results returned to ultimately exceed the totals of 2014-15 and 2013-14. So after three rounds, the basic Draw-4 System is up 7.08 points from 18 bets, an ROI of 41.6%. Only one Away Steamer in the EPL this weekend, and Liverpool came up short. The only Bundesliga match I want to write about is the Bayern Munich bet on Friday night, which paid off without any worries - 2:0 up after 13 minutes, and running out 6:0 winners. Werder Bremen will be glad to get that fixture out of the way, having lost their previous four games in Munich by 6:1, 5:2, 6:0 and 5:0. This is a rather one-sided fixture! In baseball, Sunday saw the San Francisco Giants join the sub -300 (75%+ Implied Probability) club as 1.32 favourites to beat the Atlanta Braves, but were available pre-game on Betfair at 1.35. They cruised to a 13-4 win and became the 13th hot favourite to win, with just 2 losses. Recorded against the (usually beatable) official lines, the profit on the season so far is 1.97 points, an ROI of 13.1 %. It's also interesting that fewer teams, a lot fewer in fact, have been starting at 1.5 or less in the last few seasons. The 356 in 2004 became just 124 ten years later. And so far in 2016? Already 218 bets, with a full month to go. 53 of those, not surprisingly, are the best record Chicago Cubs, although it's a little surprising to see the team with the second best record (Texas Rangers) as short as 1.5 only three times so far, but they did win all three. The last two were in the second half of August, so expect them to be a bet in September. The Yahoo Finance site redeemed itself a little this weekend with an article reporting on the reaction of the stock market to a big single-day sell-off. Long time readers will know that in genuinely tradeable sports (those with relatively frequent scoring such as basketball and cricket) the market frequently overreacts to short term scoring streaks (I wanted to say runs, but with cricket mentioned, that could be confusing). Cassini champions trading in play particularly on team sports with markets that have good liquidity but that are far from the most popular. His favourites are Basketball and NFL and he makes no secret of the fact that his strategy largely involves laying low when a market shows signs of greed. As the Yahoo Finance article makes clear, and as is the case with trading sports, each instance 'comes with unique circumstances', but fear and greed are emotions that most people find difficult to control, and it is this weakness in others that gives those of us able to control our instincts, a persistent edge. My first personal experience of this was back in 1987 when I was working in the City of London, and after an unexpected long weekend due to The Great Storm of 1987, Monday 19th October saw the FTSE 100 drop 10.84%. I quite clearly remember justifying my decision to myself that night to buy more shares the next day since they "obviously" couldn't go down much more, only to see Tuesday 20th October's FTSE 100 drop another 12.22%. Lesson learned! 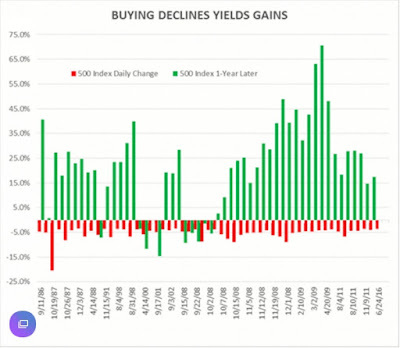 In the history of the stock market, some of the best buying opportunities occurred after sharp sell-offs, with some of the single best days following the single worst days. Adviser Investments’ Daniel Wiener reviewed the performance of the S&P 500 - via the Vanguard 500 Index Fund — to see how the stock market did in the year following one-day sell-offs of 3.5% or more. As with most stock market patterns, the track record isn’t perfect. But it’s impressive. 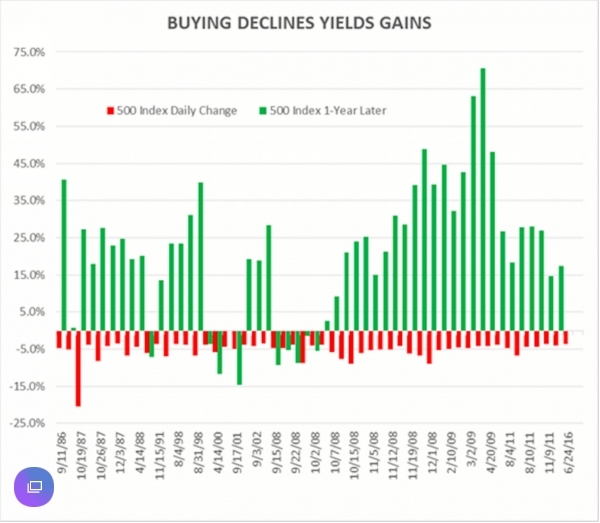 “Investors have only seen negative returns in 10 of those years, so the likelihood you’d make money one year after a 3.5% or greater drop was better than 81%,” he said. There are a million things that can be said about why this happens. Of course, each of these 53 instances come with unique circumstances. And there’s also plenty to be said about the frequency in which these swings occur with the advance of algorithmically-driven trading. One thing to highlight is the presence of psychology and behavioral biases in the stock market. Indeed, when the market gets riled up, traders and investors often push prices too far in either direction creating opportunities for contrarians willing to go against the herd. June 24 was when the UK unexpectedly voted to exit the European Union. The stock market has already recovered those losses and then some. The Bundesliga starts tonight, with Champions Bayern Munich at 1.1 to beat Werder Bremen. In the past four seasons, Bayern Munich have Closed at 1.11 or shorter (90%+ Implied Probability) 15 times, and won every match. At the 80%+ IP level, backing Bayern Munich would have resulted in a 1.65 profit from 52 bets, an ROI of 3.2%. For anyone wondering if Away Steamers are also profitable in the Bundesliga, the answer is historically, yes. Again looking at the past four seasons, and Pinnacle's Closing Prices courtesy of Football Data, backing the 154 Away teams whose price shortened by 10% or more would have won you 9.42 points (ROI of 6.1%). Home Steamers of the same 10% are value lays, backing the 77 at Closing odds would have lost 17.01 points, an ROI of -22%. Many of you will be familiar with the Bundeslayga System. A review of this System's performance using Closing Odds shows a theoretical profit of 4.47 from 361 selections from 2012-2016, an ROI of 1.2%. This compares to the 8.12 point profit at the earlier scrape prices, and evidence that Closing Odds are more accurate. The numbers show that historically home favourites are not value backs beyond the 50% range, and that laying home favourites in the 40% to 75% implied probability range would be a better strategy, and I am following this for the 2016-17 season. Bundeslayga has been a steady profit maker for several seasons now, but in Bundesliga.1 last season, it made its first loss, although Bundeslayga.2 made up for it. Time for a change - markets adapt, and this one may finally have caught up with us. The selections should almost double to around 166 a season. Related to yesterday's post, and for Peter and Jimmy's 'even money shots', a fair and balanced range from 1.91 to 2.1 would have lost 5.69 points from 173 selections (ROI -3.3%). "At kick off? Admittedly, it is possible that Jimmy has access to kick-off (Closing) prices from several bookmakers, but I am not aware that this data is readily available." This is a bugbear of mine with Betfair. Since 2014 they have had SPs on Premier League games but unlike all their other SP prices they do not publish them. I have asked in vain. I have taken to recording them this season myself. Would be interested if you know of anyone who has recorded them since they started and would be willing to make them available. I do not know of anyone who has Betfair SPs, but unless you have good reason to suspect that Pinnacle's Closing Odds are not accurate, I would simply use those. Recording them yourself sounds like a big commitment for little gain. Betfair's decision not to make them available, but make racing and other SPs available suggests to me that there is value in the former, and not in the latter. Some rather sloppy 'research' (I use the term loosely) over at Pete Nordsted's site, looking at "even money shots" in football's top leagues. Classifying teams priced between 1.9 and 2.1 seemed very enough as it included teams at the 9/10 level through to 11/10. What "seemed very enough" means I'm not sure, but I'm guessing the writer (Jimmy) means "seemed good enough" but it really isn't. 1.9 (or 9 to 10) means the selection has an implied probability of 52.63%, with the inverse of that bet being 2.11. 2.1 (or 11 to 10) means the selection has an implied probability of 47.62%, with the inverse of that bet being 1.91. So presuming you want your range to be fair and balanced, it should either be from 1.9 to 2.11 or from 1.91 to 2.1. Unless you are into your statistics, this may seem picky, but by using a range of 1.9 to 2.1, you are including more odds-on selections in your sample than you are odds-against. To clarify, by Jimmy's logic, and by extension, more expansive ranges would then be those from 1.8 to 2.2, from 1.6 to 2.4, from 1.2 to 2.8, and ultimately from 1.01 to 2.99. But the average is still evens... No it isn't. A win ratio of 45.5% overall - and a loss of 16.13 points from the 189 matches. Missing from Jimmy's post is any mention of profits or losses, which is quite an oversight. I would hope this isn't intentional, with the reader expected to assume that the odds average out at evens and backing "even money shots" is thus profitable, because they don't and the strike rate at 1.9 is quite different to that at 2.1. "But Cassini, that's a big difference", I hear you say, and you're quite right - it certainly is. Please see below for a breakdown of the four major leagues with a home and away split of results for teams with a best price between 1.9 and 2.1 at kick off. At kick off? Admittedly, it is possible that Jimmy has access to kick-off (Closing) prices from several bookmakers, but I am not aware that this data is readily available. Hence my excitement when Football Data updated the past four seasons with this data. Anyway, including matches where one "best" bookmaker is offering a generous (but probably unavailable in practice) price of 1.9 is another reason why this 'study' (I use the term loosely) is worthless rubbish. Unfortunately, the Crystal Palace related predictions are not looking as amusing as they once were. No goals and no points after two games, and if it wasn't for AFC Bournemouth, last place. Next weekend's fixtures see the first six-point relegation clash of the new season between the two clubs, with Crystal Palace a very generous 2.38 on the Exchanges for the home win, although not as generous as the frankly crazy 2.54 that was available earlier. There was a paucity of Draws in round two of the EPL, with just the Leicester City v Arsenal match providing a winner. The basic Draw-4 System (back the draw at 4.0 or shorter) is now up 0.25 points from 14 selections. With 5.25%+ of the EPL season already complete, Draws are at 20% with Aways looking to continue their improvement of recent seasons currently at (an unsustainable) 45%. As for Away Steamers this weekend, again the system was profitable with Hull City's 11.11% increase in implied probability a winner at 4.95 (@ Swansea City) more than compensating for the first loser of the season at the Olympic Stadium where AFC Bournemouth failed to beat West Ham United despite steaming in by a massive 27%. Since 2012, Away Steamers of 25% or more have been few and far between, but the 16 selections (including this weekend) are in profit by 11.59 points. Three of those 16 were AFC Bournemouth, (all lost), and three more were Aston Villa (all lost). After 5 selections, Away Steamers are up by 9.38 points this season. The (anti-) Brexit bets are looking good, with the triggering of Article 50 becoming less and less likely as reality and referendum 'time decay' sets in. "Not triggered before July 2017" has traded as low as 1.31 on Betfair, and not being triggered in 2016 at 1.03. We should have more of these advisory referenda. ...a state referendum saw 68% of West Australians in support of leaving the Commonwealth, but the application was knocked back by the British parliament. Farage, Johnson and Fox have won their 15 year-long battle to obtain a vote for Brexit. But Britain is not out of Europe. And as the UK public realises the damage to their future that isolation represents, there will be a re-think. May is no Europhile, but she does not want to lead a Britain that become poorer and weaker in wealth and status, with the ever-present shadow of Scotland leaving the UK too. The Europhobes who brought us Brexit may not have the last laugh. Although what will finally eventuate as a result of the advisory and non-legally binding, referendum is yet to be known for sure, the "win" for the 'Lying Leavers' looks more and more meaningless by the day. It's rather schadenfreudey, but discussing Brexit these days with a Leaver is a little like watching an opponent's fans celebrating a goal before they belatedly realise that it has been disallowed. I really should rise above it, but I happened to come across one of my local's more vociferous Leavers (a Charlton Athletic fan for the record) on an alleged WikiLeaks list of BNP members last week. Moving on, and there are some crap articles on the Yahoo! Finance site (and many other sites) these days. Don’t bother clicking on the click-baity link for this one, (I should have known better) which led with the bogus headline "How one couple saved $1 million in 4 years to retire by age 43"
The headline is nonsense, and yes the numbers are in $s, but the principles are the same. The couple started with $570k, so they never ‘saved’ $1million in four years. With a decent amount invested, the bulk of an increase in savings is going to come from your return on that investment. The broad S&P 500 index has performed well under Obama (Democratic Presidents are historically much better for the US stock market than Republicans) - Go Bernie, I mean Hillary - 2011 was actually a down year (by 0.003%) and 2015's loss wasn't too serious either. The couple featured in the article "decided to get serious about their savings goals" in 2013, so if they caught that 29.6% leap of that year, that's a tidy $169k right there. Carl noted that his programming job paid well, but did not share specifics. Savings is simply your income less your outgoings, and the larger your discretionary income is, the greater your savings potential, assuming your expenses are the same (which they are often not due to lifestyle creep). If the couple in question were earning $240k a year between them, what’s the big deal about saving 10%? Financial advice I gave my kids from a very early age was to put at least 10% of everything earned into an index fund and forget about it. Keeping that MPC under control as your income increases, helps. I wish I’d had a Dad like me! The article does suggest keeping records and analysing your spending habits, which is an excellent idea, but for most of us, saving money is slow and steady and very much constrained by income. I made an error in my calculations on EPL Steamers and Drifters. Very embarrassing, but the numbers in the original post have been updated as leaving them there incorrectly would have been misleading. Fortunately the main discovery, that Away steamers are profitable, is still true, although 87 selections steaming by 10% or more in four seasons isn't much of a sample size. For what it's worth, the revised ROI% for these is now 18.5%, although it will have climbed following the weekend's results. As shown, three Away teams shortened by 10% or more, and all three won which would have been a 29-1 treble for those who do these things. For those tracking the Draw in the EPL this season, the basic 4.0 or less draw price meant eight qualifiers, and three of those ended 1:1 for a 2.75 point profit. Leicester City's opening day loss has also moved my Top 10, Top 4, Top 3 Lays into the money already. At somewhere in the ~1.6s for a top 10 finish, they are still too short in my opinion. Several of those top ten places are all but filled already, and with the distraction of the Champions League, I can see Leicester City struggling to finish above the likes of Everton, Southampton and West Ham United (although the latter may experience a slump in form as they settle in to a new stadium). I was hoping my Crystal Palace would be in contention for a top 10 finish too, but an opening day home less to a bottom half team wasn't the most promising of starts (unless you are following the Away Steamers system I guess). Fair points about the bookies selected. Finding the right price is obviously the key to all/any strategy. As requested if you take the best of those 5 prices over the ten years, you get an 8.65 profit from 2808 selections. 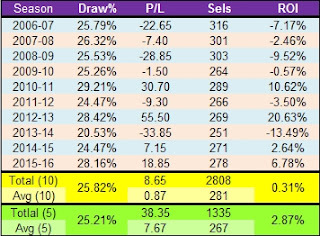 Profit results from some big swing years (10/11, 12/13 & 15/16) all of which had (unsurprisingly) above avg draw % in those respective years. I put Smithlondon's numbers into the table above, and added the averages and totals for the past five and ten seasons. As I had suspected, using the best of five price makes this strategy profitable over the past ten seasons, although not from 2006-10. It's probably no coincidence that the Home team won 47.6% of matches in this time, and just 44.9% in the six seasons since, while the Draw numbers remained fairly steady at 25.7% and 25.9% respectively. Interesting that the two seasons 2011-12 and 2014-15 saw exactly the same number of draws overall (93) yet the later season would have produced a profit while the earlier won lost a little. 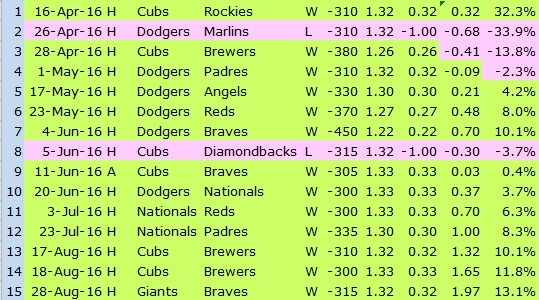 I mentioned a while ago that I had forwarded the details of some of my portfolio systems to Geoff, As I know that losing runs can and do occur, I put in my email that "Of course, Past Performance is no Guarantee of Future Results." Geoff wrote to me yesterday, saying "I have a bone to pick with you". I was just wondering how you are getting on with the TBone in recent weeks as I'm wondering if I have chosen to get involved at completely the wrong time? He didn't actually sau that he had a bone to pick with me, a strange expression that only a mother would use, but T-Bone did have a poor July, with the straight up bets losing 16.44 points and ending the month with a 3-11 record, but August's 10 selections have produced 7 winners so far and are +2.04 points so far. On the season overall, the system is up 9.28 points, but that's of little comfort since we only found this system last month! I say give it time. Finally, for those who haven't yet seen it, a post from Steve M on why he won't be following any football tipsters this season. Click on the link for the full post, but some of Steve's numbers are interesting. Over the last 6 years I have placed 16,666 bets, that averages out to 7.6 bets every single day for 6 years straight.As mentioned earlier, with 16,666 bets, that means months worth of data entry, months worth of finding and/or waiting for the best odds, months worth of placing bets and months worth of recording results. Not to mention the fact I would sit up and watch all the games. Each week I would spend at least 4-5 hours on soccer betting (just placing and recording bets). Let’s say the season runs for 8 months. That means I would spend 160 hours a year or a total of 960 hours over the past 6 years. We can double that number to 1920 hours when we include all the watching and other activities. That works out to waking up at 6 am and working non stop till 10 pm every day for 4 months straight. That is a lot of hours! For me, the best part of betting with a portfolio is that you are punting, not trading, and so you don't actually need to watch the games. Being based in Australia, it's even worse for Steve with many matches in the middle of the night. I suspect many sports bettors conveniently forget to include the hours spent when calculating their profits. ** This all but guarantees that by November, Leicester City will be a top three team, Crystal Palace will be relegated, Alan Pardew will be the first managerial casualty of the EPL season, Donald Trump will win the Presidential Election by a landslide and Article 50 will have been triggered. Smithlondon had a comment on my findings regarding backing the Draw in the EPL, and has gone further by conducting further research looking back further than four seasons. To clarify, the reason I chose the past four seasons is that these are the only seasons for which Pinnacle’s data is available, and now with the added bonus of the closing prices. The reasons Pinnacle are the sportsbook of choice are that they have the most favourable over-round at ~102%, and they do not restrict or close winning accounts. "Backing the draw in the (conveniently exactly) 1,000 matches where the implied probability of the Draw was 0.25 or greater at kick-off would have boosted your account by 49.22 points, and you can all work out the ROI% on that. 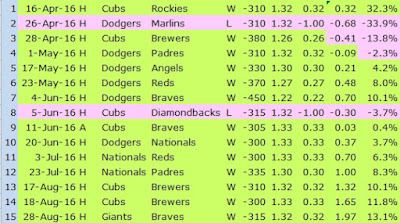 (+50.33 from 1,017 selections if you bet early)." As always your blog is an interesting read. The above caught my attention. I don't currently bet on football but I'm always looking for new systems to add to my portfolio. I believe diversity is important, so naturally those numbers piqued my interest, and with the season starting I decided it was worth a few hours of my time to have a look at. Even if it was more in hope than expectation. So I data dumped the sheets from football-data (excellent website) and went to work. I took the odds of five of the bookies listed (B365, BWIN, Lads, Hills, VC) for the last 10 seasons. I used those as they seemed to be the only ones listed for the complete 10 years. 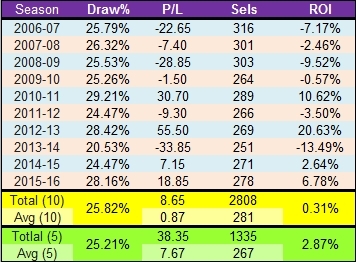 Averaging the odds and then applying your criteria (Back the Draw when implied prob > 0.25) gave me a return of 7.73 points from 1134 for the last four seasons, but a loss over the 10 seasons of -96.16 from 2937. I got closer to your four year results when I adjusted the average odds to represent a 100% book (my proxy for exchange odds). In that case I got a 39.81 point profit off 1005 (while applying a 5% commission) but I still registered a loss of -26.35 over the 10 seasons(2689). While I'm not suggesting your approach or numbers are wrong, a longer term view dampens the enthusiasm somewhat although I'm still searching for your filter. The over-rounds on B365, BWIN, Lads, Hills and VC are all higher - VC (selected at random) is 103.22% - so you are always up against it with these books, and if you look like you have anything resembling a clue as to what you are doing, your account will be closed or restricted to peanuts anyway. Bottom line is that these books don't bring a lot to the party for the serious bettor so I try to ignore them. Just how bad are the non-Pinnacle books? Of the 1,520 EPL matches over the past four seasons, Pinnacle (outnumbered 5 to 1 remember) were beaten for best price on the Draw 604 times, less than 40% of the time. Of course, if you can get on with the sportsbook offering the top price, you should do so - using Pinnacle's prices here are for record keeping, and returns given are always the least you can expect. So I’m not sure that AVERAGING the (already poor) odds on these five books makes any sense. Pinnacle may not always be the best price, but they are rarely too far off, so to get anything like a meaningful comparison going back an additional six seasons, a better approach would be to use the best (MAXIMUM) available price. Unfortunately I don't have the time to go back six more seasons and run the numbers, but the Best of Five are comparable to Pinnacle's profits, and the Draw hit rate between 2012-16 was 25.4%, while for the six seasons 2006-12 it was 26.1%. Perhaps Smithlondon can re-run the numbers using the best prices? It's quite possible that the six seasons up to 2012 were not profitable with this strategy, because both the EPL and the markets are constantly evolving. How many seasons to look at when evaluating a strategy or a system is up to the individual. I personally think results from ten years ago in the EPL are totally meaningless, although some 'experts' have no problem using data from past match-ups, despite the fact that the players, managers and possibly venue have all changed since previous encounters, e.g. "Twelve of the last thirteen EPL meetings between these two sides have seen at least two goals", as if a match six or seven seasons ago has any relevance today. I will spare the below preview "writer's" blushes by not linking to his site, but count the 'certainly' references in just two sentences! Nothing is certain in betting, and it’s a paradox of profitable betting that if you wait until you have a statistically proven edge, the edge will be gone. In my opinion, the trick is to spot a trend (and an edge) early, act on it while maintaining a healthy scepticism that the trend may be fleeting and evaporate at any moment, and stop when you determine the edge is no longer there. Right now, the Draw in the EPL appears to offer value in matches of a specific profile. Was value there in 1985? Will it be there in 2020? Mixing metaphors I know, but no one should be a one-trick pony, nor have all their eggs in one basket. Smithlondon mentions he has a portfolio, and this is the best approach. Track the performance of each system appropriately, constantly develop new systems, and add / remove them from your portfolio as the results dictate. The benefit of a portfolio with diverse systems is that the variance of any one individual system is moderated. It’s an approach that works well with financial investments too. Putting all your money in one stock is a recipe for disaster – use mutual funds, preferably passive Index Funds! (http://www.bettingtools.co.uk/tipster-table/tipsters/market-movers/426) has prompted me to trial something similar in English Football, again using Betfair's exchange. I previously thought that the odds movements for football would be far less significant than in horse racing but your post, albeit analysing Pinnacle's closing prices, gives me hope. Findings from our football betting so far have shown that selections priced 2/1 and above are where the majority of value can be found and mostly in away selections. So to begin with I'll be looking at homes and aways that have come in by 1% or more (with significant enough liquidity) that are priced over 2/1. Odds will be collected every 30 minutes in the lead up to kick off. I'm not sure something that moved by just 1 percent is necessarily a steamer though and will go with the tres basique name of 'Footy Movers' for this profile. I can easily amend to set a similar profile up for the draw if you or anyone else has any ideas for criteria that you think could be of interest. Check out that last link as the season progresses, and let Brian know if you have any requests. What's the filter? Have I missed something? As draws are low scoring can additional profit be made by betting the unders or correct score1 1-1 and/or 0-0 ? Unfortunately we, or at least I, don't have any Correct Score prices, nor do I have closing prices on the Unders, but running the numbers based on the early scrape, backing the Unders where the Draw price is 4.0 or less would have lost you 52.08 points over the past four EPL seasons, and that is generously using the maximum Under 2.5 price from Football Data. Applying the filter I mentioned (but didn't reveal, as I give far too much information away for free as it is) and the Under does move into profit, although a minuscule one at 0.19 points. Looking at the four other top leagues (La Liga, Bundesliga, Serie A and Ligue 1) the total profit here is potentially 32.98 points. While it is true that if the Under is a value bet, then the Draw is always a value bet, it isn't necessarily true that value on the Draw means the Under is value. Essentially this 'anything-but-subtle' très basique system, takes advantage of an inefficient market consistently underestimating the probability of the Draw, which is not a popular outcome for some reason, and long may it continue to be ignored. 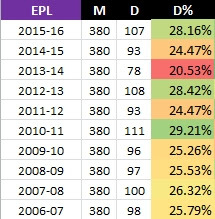 Overall in the EPL (since the 20 team format was introduced in 1995), Under Draws (0:0 and 1:1) make up 75.8% of Draws (and 19.8% of all matches). Blindly backing every Draw priced at a 0.25+ probability results in 71.3% of the Draws being Unders. Backing the draw in the (conveniently exactly) 1,000 matches where the implied probability of the Draw was 0.25 or greater at kick-off would have boosted your account by 49.22 points, and you can all work out the ROI% on that. The one losing season was not surprising 2013-14, when the Draw hit at just 20.5%, its lowest total in the past ten seasons during which the draw averages 25.8%. There is a simple additional filter which can be applied to both reduce the volatility and increase the profits. I am attracted to the draw as clearly the more attractive proposition in these games. I know it can be very difficult/boring to back the draw but think about this. If you are consistently on the side of the bet that makes the bookmaker cheer out loud then long term you will not go far wrong. I really don't understand this idea that backing the draw can be difficult/boring. Where is the problem? The beauty of systems like these is that you place your bet and go on with your life, but the more people that have a problem with backing the draw, the better for me. Serious betting should be boring and emotionless. Do actuaries get excited when they take on new business? A poster on the Betfair form pointed out that this weekend's round of twelve Championship matches are a little unusual in that none have an odds-on favourite. This is unusual (it last happened on the weekend of April 26th / 27th 2013) but odds-on selections in the Championship (33.33%) are much less common than in the less competitive EPL (53.9%). These statistics are based on Pinnacle closing prices for the past four seasons 2012-16. There's nothing magical about a price being odds-on of course. Value can exist at any price, but plenty of people, some who should know better, seem to think that backing at odds-on is never a good idea. Using data from the past four seasons shows that blindly backing odds-on selections in the Championship would have resulted in a loss of -3.9 points from 736 selections, compared with a loss of 2.8 points in the EPL, although backing Away teams only would have been profitable in both leagues. 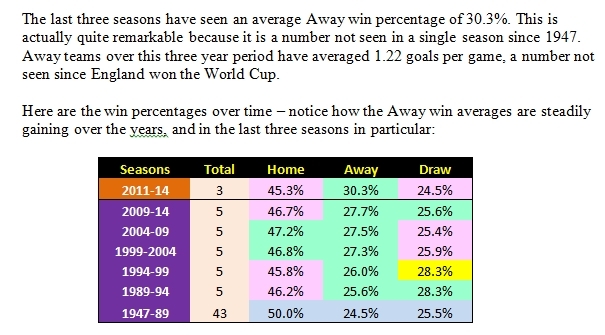 Updated to include the last two seasons, and those Home, Away and Draw numbers are 44.5%, 30.3% and 25.2% respectively. It was also a trend observed in other top European leagues. It isn’t only in the EPL that this trend continues. Serie A had the fewest Home wins since the turn of the century (40.0%) with the three highest totals for Away wins being in the three most recent seasons. In La Liga, Home wins were at their second lowest this century (45.0%), with the most recent two seasons producing the most Away wins in that time, both above 30%. Ligue 1 also saw the most Away wins this century, beating the record set the previous season, but here the increase came at the expense of the Draw rather than the Home win. As is so often the case, the Bundesliga marches to a different beat. 2014-15 saw Home wins exceed the long term averages, while Away wins were at their lowest since 2003-04 although it should be noted that four of the previous five seasons were the top four for Aways in this league. Perhaps last season will prove to be a blip here? Indeed last season was a blip, with Away wins in the Bundesliga just two shy of their all-time high last season. Ligue 1 broke its own record last season, and Serie A also set an all-time record for Away wins. Of the top leagues, only La Liga showed a decline, perhaps another blip?